Snowflake OPEN series Jan and Feb 2019. 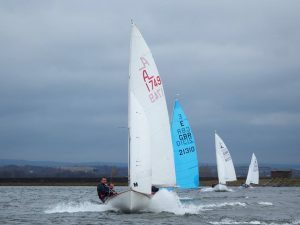 All North West sailors are invited to take part in the popular and exciting Snowflake OPEN series which runs at Elton SC on Sundays from 6th Jan to 24th Feb 2019. Three races each Sunday, first starting at 12.00noon. Entry fee for the whole series is £25 which includes temporary berthing at the Club for the series. We had some 28 boats out on the water for the “Elton Cauldron” event – the taster for this series – on Sunday 30th Dec 2018, so lets see you North West sailors down on the water. As always you are assured of a warm and friendly welcome with kitchen and bar facilities to keep out the cold. Next PostXmas gift – Sailing Club Membership.